There’s a lot going on this week as Madison celebrates Bike Week. Check out the Bike Fed’s website for details on all the commuter stations, rides, and other events on tap! 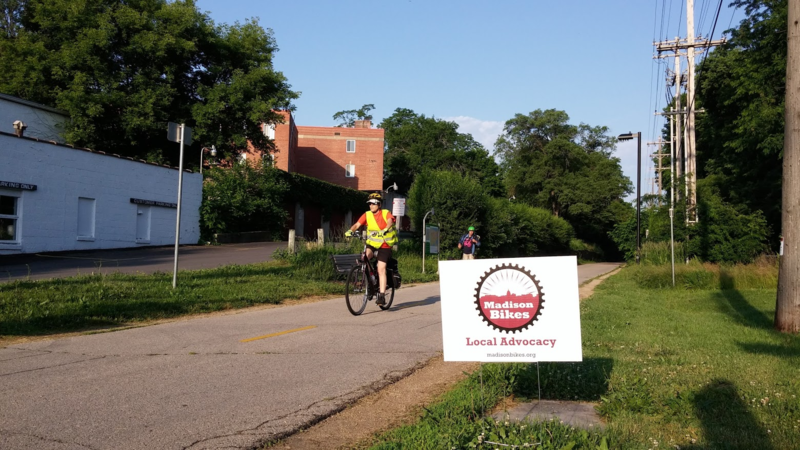 Madison Bikes will have a table at Bacon on the Bike Path on Thursday morning. But along with all the fun, there’s also some work to do on Tuesday as approval of the Wilson Street cross section design comes in front of the Madison Common Council (item #31). The recommendation that will be in front of the council is to reconstruct the street, as-is, with no accommodations for people on bikes. This recommendation was approved by the Board of Public Works in May, but it included a critical amendment offered by Alder Denise Demarb. The amendment was to commit to adding appropriate bike facilities to Wilson Street once the Judge Doyle Square development is complete (currently estimated for 2020). While it’s a disappointment to kick these much needed improvements down the road, our Engineering department has confirmed that the planned design will easily accommodate adding these facilities when the east half of this stretch of Wilson Street is reconstructed in 2020. Watch for an action alert later today to write the common council and/or to give public comment at the meeting on Tuesday. We need to ensure that the city commits to adding these critical and long overdue improvements to this important downtown connector.